What are Adverse Childhood Experiences (ACEs) ? Sometimes called "the most significant public health survey that no one has ever heard of," due to the time it took to reach public awareness, a 1998 study done by Co-Principal Investigators Robert Anda, MD and Vince Felitti, MD for the CDC and Kaiser Premante, brought together 10 questions about childhood houshold experiences that they were finding indications that these experiences in childhood be linked with adult health and wellbeing. These 10 questions, called "ACEs" range from having a parent with mental illness, to witnessing domestic violence. The study's results were shocking and groundbreaking, as they identified a link between the frequency of these 10 ACEs and outcomes for adult health and mental well-being. Read more about the background on ACEs here. Much knowledge of Adverse Childhood Experiences (ACEs) relies on data predominantly collected from white, middle- / upper-middle-class participants and focuses on experiences within the home. During the initial convenings of the Philadelphia ACE Project, members wondered if living in an urban area might bring particular stresses not covered in the original ACE study. 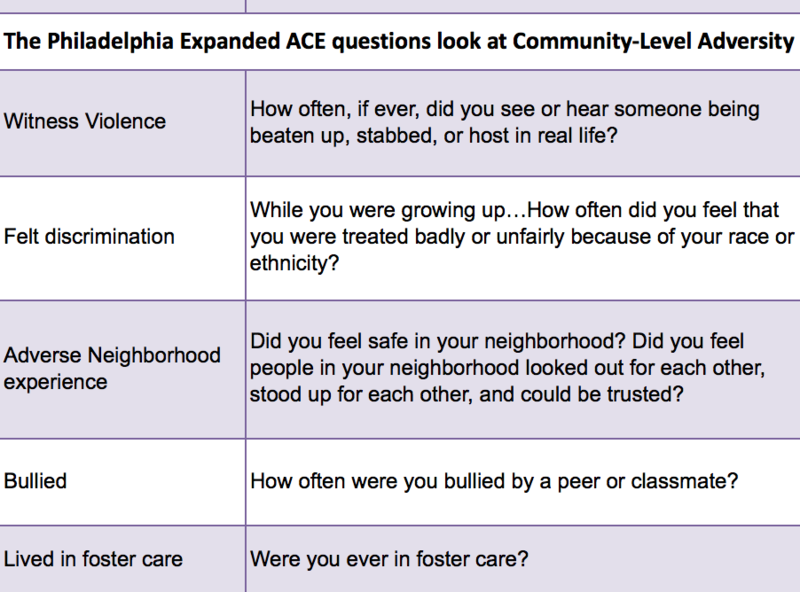 In 2012 and 2013, members came together to develop the Philadelphia Expanded ACE Study to understand the impact of community-level adversities. In conjunction with the Public Health Management Corporation’s Household Health Survey, researchers surveyed 1,784 adult participants in Philadelphia about the original ACEs and five additional community-level stressors. Using a more socioeconomically and racially diverse urban population, Conventional (household) and Expanded (community-level) ACEs were measured to help understand whether Conventional ACEs alone can sufficiently measure adversity, particularly among various subgroups. Philadelphia's demographic makeup looks significantly different than the original study, in which the majority of participants were white, college-educated, and middle-income. In Philadelphia, where roughly a quarter of residents live in poverty, researchers found that almost seven in ten adults had experienced one ACE and two in five had experienced four or more. The community-level indicators included witnessing violence, living in foster care, bullying, experiencing racism or discrimination, and feeling unsafe in your neighborhood. Researchers found that almost 40 percent of Philadelphians had experienced four or more of these expanded, community-level ACEs. To view the report on the Findings of the Philadelphia ACE Survey, click here. To request a copy of the Philadelphia Expanded ACE Survey questions, click here. To request access to the Philadelphia ACE Data, click here.